The campaign season for 2018 midterm elections have begun. Across the country, current and aspiring politicians are vying for positions at the national and state level, including Connecticut. But the 2016 election is still on everyone’s minds. From the Russian issues, to a host of other controversies, the hype around the 2016 election was real. A recent paper by Markus Prior and Lori Bougher of Princeton University, makes mention of an overall increase in campaign interest for 2016, using information from the American National Elections Studies. However, what they argued is that the hype didn’t translate into a greater turnout; the numbers for 2016 were comparable to that of other recent presidential elections. Specifically, the paper cited data from the United States Election Project, saying that 60.2 percent of eligible voters went to the polls 2016. This is more than 2012, with 58.6 percent, but less than 2008, with 62.2 percent turnout. More people voted in 2016 for president than 2012. 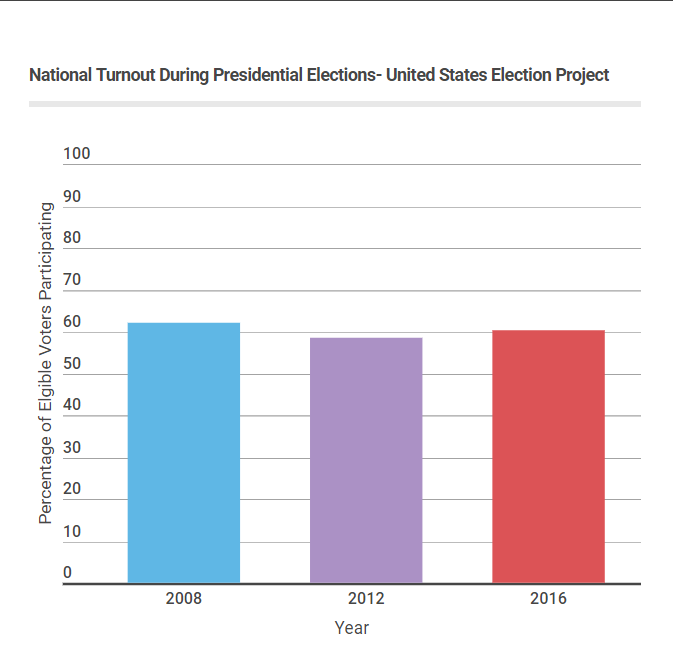 However, the turnout in 2016 is less than the turnout in 2008. As for Connecticut, the numbers are similar to the national figures. Using numbers from the Election Project for presidential votes, in 2016, 65.4 percent of eligible voters cast ballots in the 2016 election. For 2012, 61.3 percent turned out. In 2008, 66.6 percent of eligible voters participated. 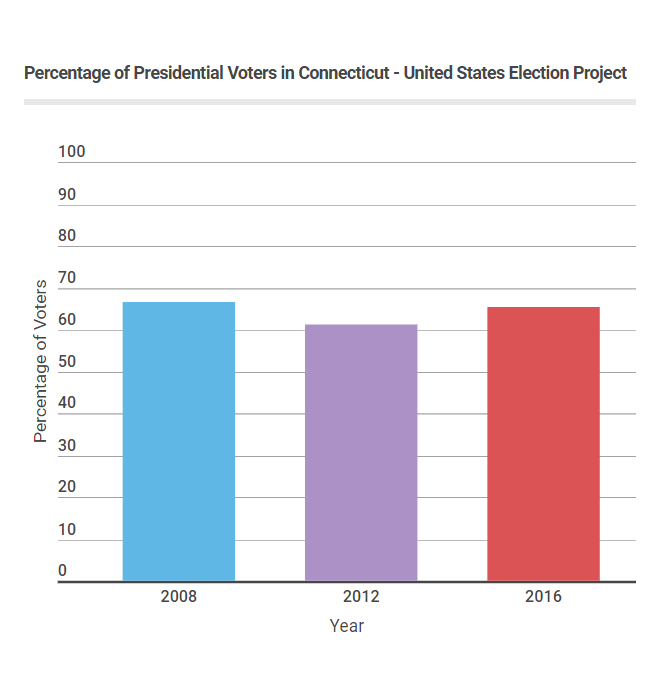 The voting trend in Connecticut is similar to the national trend. Quinnipiac’s Chair of Philosophy and Political Science Scott McLean said that there were many ways that the 2016 election was an average election. For example, independents usually prevent the party in power from having three consecutive terms, which in 2016 would have been the Democratic party. “Most polls make the mistake that the undecideds in the last days of the election will just break evenly. No, they always break away from the party in power,” he said. But the perception that voters were energized to vote was because there were so many new dynamics. McLean said the 2016 election sparked interest because Trump and Hillary Clinton were two unconventional candidates. For Clinton, he noted that she was the first female candidate in the general election and had experience being the first lady when her husband Bill was in office. As for Trump, McLean said that people were drawn to him because he was an outsider who was able to get the nomination despite early resistance in the Republican party. The news media also played a big role in the hype around the 2016 election, publicizing investigations into the candidates, and the potential of Russian meddling. “You never know what was going to happen from one day to the next. It was drawing a lot of interest. It was also generating extremely high levels of disgust and anger, so that people were tuning in and coming away from it not really more educated about the issues, but more angry about the candidates,” McLean said. Marjorie Bonadies, an at-large Republican councilwoman in Hamden, agrees. She calls the 2016 election cycle “the best soap opera “ in the country’s history. She blames the news media in part for stirring the pot and disenfranchising some voters. “It was a daily barrage of who said what, who was under investigation, Hillary Clinton’s emails; you couldn’t write it any better,” Bonadies said. Politico compiled some of that “daily barrage” in an article from Nov. 11, 2016. It showed a spectrum of stories during the course of the election. Some of the headlines included, “Trump recorded having extremely lewd conversation about women in 2005,” which ran in the Washington Post, and “Foreign Government Gifts to Clinton Foundation on the Rise,” published by The Wall Street Journal. This article appeared in the Washington Post on Oct. 8, 2016. This article appeared in The Wall Street Journal on Feb. 25, 2015. Jeffrey Foy, an assistant professor of psychology at Quinnipiac University, blames the public in part for the hysteria around the last presidential election. He said that the public finds the news boring, so they’re attracted to salacious stories. In turn, the news media are capitalizing on it. Brad Macdowall, who is a Democratic councilman for Hamden’s 9th District, said that politicians can also be blamed for dropping the ball. He said the Democratic party “fell asleep” during the 2016 election. Foy was surprised by the Trump victory 2016, but he said that was the result of personally sticking to liberal-leaning social circles, thus being less exposed to conservative views. He said that, in the process of shaping a narrative for the election result, the right wants to emphasize a sense of exceptionalism, where the left is reflecting on their mistakes. In gearing up for the 2018 midterm Macdowall has reflected on the mistakes, as he is also a Democratic consultant. For Connecticut, Macdowall is focusing on seats in the state senate, which are currently tied 18-18 between the Democrats and the Republicans. He said that this was unheard of for Connecticut to not have a Democratic majority in recent history. Macdowall wants the Democrats to find their message again. “Just think of where we came from in 2008, the party of ‘Yes We Can’, to 2016, where we became the party of shoving Hillary Clinton down everyone’s throats,” he said. However, Macdowall is optimistic about the Democrats’ chances in 2018, considering that there will be opportunities for new faces, like in Connecticut’s 5th District. Kenneth Dautrich, an associate professor of public policy at the University of Connecticut, also said that the Democrats have good odds. Back in 2016, Bonadies ran for a state representative seat, but lost. She said that there is still some Republican momentum in Connecticut, as the final result in her race was closer than expected. Even though Bonadies said the Republicans have merit in the Connecticut midterms due to their positions on taxes and government debt, she said they’re still “swimming in the deep blue Democrat state of Connecticut,”. “This coming election year would be ripe for a Republican, but the machinery in place for the Democratic party is pretty powerful,” Bonadies said.